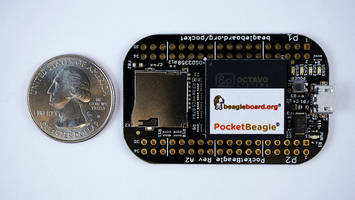 PocketBeagle® Development Board features 72 expansion pin headers with power and battery I/Os. Unit is integrated with 44 digital I/Os and digital interface peripherals. Product is equipped with microUSB host/client and microSD connectors. Board is compatible with Cloud9 IDE on Node.js w/ BoneScript library. PocketBeagle® is based on OSD3358-SM 21mm x 21mm system-in-package which comes with 512MB DDR3 RAM, 1-GHz ARM Cortex-A8 CPU, 2x 200-MHz PRUs and ARM Cortex-M3, 3D accelerator. PocketBeagle® is an ultra-tiny-yet-complete open-source USB-key-fob computer. PocketBeagle® features an incredible low-cost slick design and simple usage, making it the ideal development board for beginners and professionals alike. PocketBeagle® is based on the new Octavo Systems OSD3358-SM 21mm x 21mm system-in-package (SIP) that includes 512MB DDR3 RAM, 1-GHz ARM Cortex-A8 CPU, 2x 200-MHz PRUs, ARM Cortex-M3, 3D accelerator, power/battery management and EEPROM. The ability to purchase the Octavo SIP independently offers flexibility to expand your BeagleBoard.org® BeagleBone® design into any custom application without the need tackle complex design hurtles such as the DDR3 memory, allowing for rapid development to production.